How would you like to be able to produce large quantities of live animal protein….out of thin air? Well, you can! The Soldier Fly is arguably one of the best kept secrets of sustainable farming. The larva of the Soldier Fly can be used to convert large quantities of organic wastes (including fruit and vegetable residues, offal and manure), into high quality animal protein that can then be fed directly to chickens and fish. The good news doesn’t end there. This remarkable creature is genetically programmed to harvest itself. When it reaches maturity, it will climb out of its food source, crawl up a ramp (cleaning itself as it goes) and drop into a container ready for collection. SF adults do not go into houses or eating places. They do not have functional mouth parts so they do not eat waste and nor can they regurgitate on human food. They do not bite or sting and they are not associated in any way with the transmission of disease. Not only do they not behave like the irritating flies that afflict humans, Soldier flies actually reduce housefly numbers by 95% – 100%…..by denying the flies access to food. Soldier Fly larvae are dry to the touch and have no odour. The only real issue with Soldier Fly larvae is the poor image that attaches to flies in general and larvae in particular. The mere thought of associating with worms and flies (much less fly larvae) usually fills most people with a sense of revulsion and the notion of close contact with bacteria raises thoughts of pestilence and plague. The truth is that, not only are there bacteria and flies that are harmless to humans, life as we know it would not be able to exist without bacteria and flies. The pet industry has overcome the image issue by marketing SF larvae, as live food, to owners of fish, birds, frogs and reptiles, under the more innocuous name of Phoenix Worms. In the quest for home-grown livestock rations, more robust smallholders have long experimented with earthworms and various types of larvae. Producing consistent quantities of earthworms requires some skill and takes at least 90 days to produce your first harvest. Producing consistent quantities of Housefly or Blowfly larvae will happen much faster but harvesting them will put you in direct contact with some of nature’s less endearing disease couriers. If you want to produce consistent quantities of animal protein with little effort and without getting too hands on, then Soldier Fly larvae are for you. They have attracted the attention of researchers because of their capacity to consume large quantities of organic waste including pig and poultry manure. So voracious are the larvae, and such are their numbers, that they will sometimes displace worms. Like worms, they will retreat from light. Unlike worms, however, they can tolerate very hot conditions. When fed fresh manure, SF larvae convert protein and other nutrients in the manure into insect biomass. Aside from reducing manure volume by 50%, the larvae may reduce nutrient levels by 50% – 70%. Soldier Flies do not limit their interest to livestock manure. They will happily lay their eggs in compost bins. Quite often, the owner of the bin will be oblivious to the fact that it is Soldier Fly larvae (rather than worms) that are consuming their kitchen scraps with such vigour. SF larvae also handle offal and dairy wastes very effectively. This is a very handy attribute because, when you process a fish, chicken or rabbit for food, about half of the live weight is going to comprise viscera (guts), skin, feathers, scales or other inedible waste that will require disposal. Soldier Fly larvae will convert this waste to live protein leaving you with compost that has an earthy odour and the texture of ground coffee. 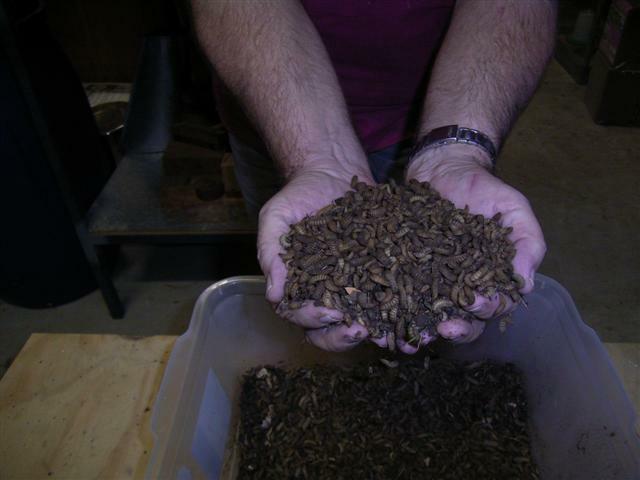 Soldier Fly larvae manure is a very useful soil conditioner and it makes excellent worm bedding. Adults mature and mate in the wild. Soldier fly adults congregate in small numbers near a secluded bush or tree in order to find and select a mate. After mating, the female searches for a suitable place to lay her eggs. She produces about 900 eggs in her short life of 5 to 8 days. The male Soldier flies do not make contact with organic waste. To optimise their chances of survival, the females prefer to lay their eggs close to the waste rather than in it. About 100 hours later, the larvae hatch then crawl into the waste, which they begin to consume. They start out white and gradually change to grey. They have the appearance of large segmented maggots and are often flat on the underside. One end is round and the other end tapers to a point. Under ideal conditions, the larvae reach maturity in about two weeks In the absence of sufficient food, or in cooler weather, it may take up to six months for them to grow to the pre-pupae stage. SF larvae pass through 5 stages. Upon reaching maturity, pre-pupal larvae are about 25mm long, 6mm in diameter, and they weigh about 0.2 grams. Pre-pupal SF empty their gut during their last moult and cannot feed thereafter. At this stage, the larva has everything that it needs to sustain it as it changes from pupae to adult fly. The ability of the Soldier Fly larva to extend its life cycle under conditions of stress is a very important factor in its management for managing wastes and as a food source for poultry pigs and fish. When the larvae are ready to become adult flies, they clear out their gut and start to look for a safe and private place in which to pupate. Famous for their ability to climb a 45° ramp, the larvae will crawl out of their food source and make their way to a collection point having effectively sorted themselves by size (only those ready to pupate will make this journey) and having cleaned themselves on the way. The SF larvae’s capacity for self-selection makes them a better choice for small livestock diets than earthworms which still have to be separated from their bedding and sorted by size using manual or mechanical means. Producing your own small livestock rations isn’t just a matter of economics; it’s a cornerstone of any attempt to produce clean, fresh food. Commercial rations may contain preservatives, antibiotics and a host of questionable ingredients. The only way you can be sure that you know what’s in your livestock rations is to mix them yourself. Dried SF pre-pupae contain up to 42% protein and 35% fat and feature an amino acid and mineral profile which leaves them well suited for use as livestock food. Feeding studies have identified that SF larvae are suitable for use in poultry, pig and fish rations. Some researchers suggest that SF larvae are the nutritional equivalent of (and a suitable replacement for) fishmeal. This has important implications as wild catch fish stocks continue to dwindle. Arguably, the biggest issue in using these remarkable creatures for livestock rations is overcoming the negative image that attaches to flies and insects. The simple fact, however, is that left to their own devices, small livestock will eat worms, larvae and insects – very often to the exclusion of expensive commercial rations. Week old ducks, chickens or quail will hunt and eat flies and most species of fish will (in the wild) eat anything they can get their mouth around. Any attempt to create sustainability that fails to acknowledge the role of bacteria and insects is doomed from the outset. Worms, larvae and bacteria transform materials like manure, plant residues and animal processing by-products into more worms and larvae and soil conditioner. The worms and larvae can be combined with other ingredients (like duckweed) to produce rations for quail, chickens, ducks, rabbits and fish and the soil conditioner can be used to enrich your gardens. Soldier Flies and backyard farming are good for each other, no matter how you cut it. Animal Protein Out Of Thin Air! How would you like to have an unlimited source of fresh animal protein – absolutely FREE? I am interested in the BSF for my chickens. I have vermicomposting bins and occasionally find BSF in them but I want to do them in a separate bin. I have seen the Biopod on the net but isn’t there a DIY way to do this? I was thinking of a bin on the ground surrounded by concrete blocks, and filling it with manure, some food waste and the BSF I find in my worm bin. Would this work? Deb……prior to buying a BioPod, we used to encourage the BSF to lay in a regular compost bin. We’d then shovel the larvae (complete with the compost) up into a 50 litre plastic tub. We’d enable them to self-harvest by putting a couple of ramps into the bin. The larvae would then crawl up the ramp and drop into another tray. Each day, we’d empty the tray. We’d give some to the chickens and freeze the rest. Nean……if you collect vegetable peelings and kitchen scraps in a compost bin, they’ll almost certainly find you. It’s better to embark on a BSF growing exercise in warmer weather and you’ll know when they’re in your compost bin because the volume of material in the bin will shrink quite quickly and it will begin to go black. Once this has happened, if you stir the compost around a bit, you’ll usually find a writhing mass below the surface. Can you use horse manure for the BSF? I haven’t used horse manure for BSF but I’m not aware of any issue. Give it a try. both for economic and ecological reasons. thanks gary for your answers to my other inquiries. polypus…..I guess we’d all like to find micro-livestock that will prosper wholly on food that we could provide at little or no cost. The closest that I can get currently is with our laying chickens. While we provide pellets, they eat very few of them because we also feed them BSF larvae and a bit of scratch grain. They free-range during the day so they must be picking up most of what else they need. We feed a few BSF larvae and duckweed to our jade perch and that reduces our reliance on fish pellets a bit but there’s a lot further to go. While guinea fowl might forage for their food, if you plan to eat them (or even to get useful reproduction) you will probably need to give them a balanced diet. Ive been culturing black soldierflies in west Afica Ghana and its amaing how they feed in W.A. They are so much abundunt in nature and i will give u the full details of my research later. I was so impressed with your article on BSF that I tried to purchase a BioPod from Murray. Murray says that his experience is that the fish are not keen on BSF unless he coats them with fish oil. Is this your experience as well? Trish…..fish are like children – they have preferred things to eat. Whenever you attempt to introduce new food to any livestock, it is advisable to chop it up a bit and mix it with something that they like to eat. If that doesn’t work, you can do what many parents do with fussy children……..deny them anything else until they get hungry enough to try something different. While my jade perch will happily eat them, I’m coming to the view that whole BSF larvae are best fed to poultry and game birds – they love them and they (along with some scratch grain each evening) will substitute for a good proportion of the birds’ normal diet (assuming that your birds are free range). 1) do BSF larvae feed on raw eggs ? would they drown on a tub of raw beaten eggs ? 2) do they feed on rotting meat ? 3) can they be used on biomass that are high in oil content? Eric……BSF larvae will eat almost anything and particularly eggs. You might need to mix the raw eggs with something to give it structure (like stale bread of vegetable wastes) or otherwise they might drown. They will eat rotting meat. As for the high oil content biomass I guess that would depend on what it was. The larvae themselves are up to 35% fat. Cherie……..an interesting question. To be truthful, I don’t know how much of the chemical content of processed food is transferred in that sort of situation. I guess the bigger issue is whether we should be feeding that sort of stuff to the kids in the kindergarten. Perhaps the answer is to feed the kids good chemical-free food and, by extension, have a better quality food scrap to feed to the BSF larvae. I am concerned about bioaccumulation and biomagnification of harmful substances building up in any of the produce that I grow. I try where I can to only purchase clean food and certainly only use ‘home grown compost’ to breed BSF maggots that I feed to my chooks and fish. When dealing with closed systems such as aquaponics harmful substances may have no exit point and I’m guessing largely remain within the organisms. Thanks for the great info. I have done some reading on Soldiers flies and their larva. I would really like to find some info on raising them entirely in a closed environment (from cradle to grave). Is there info on raising them indoors and keeping a running “larva farm” going full steam at all times? The reason I ask is that I live in an area of the USA that has freezing temps. for a good portion of the year. Any info would be appreciated. John Doe……I doubt that, due to the way that BSF breed, you could easily keep a BSF breeding operation going through a freezing winter but you can keep the larvae going for several months. Take a look at http://www.windward.org/notes/notes66/walt66-7.htm for an account of how some people keep them going through cold weather by putting them in an old freezer. I read recently that horse manure contains more cellulose than pig or chicken manure, and that the BSFL can’t break down cellulose, and therefore you would have to empty the “residue” (castings?) more frequently. However, composting worms *can* break down cellulose, and that they really thrive on the residue. It doesn’t sound like a big problem if you have a worm box, too. I red your notes with interest.I bought a “POD” last year and it produced larvae.Now,after winter, there are no more lavae. I put our foodscraps into the pod and the ambient temperature is around 30*.. I will try milk next.I live in perth. any thoughts??. rolf kessel……..if you continue to load food scraps into your ‘pod, the BSF female will eventually find it. Remember that BSF are attracted to putrefying manure and food wastes. Putting some ‘aged’ bread and milk will help get things going. i breed pigeons and am interested to know if anyone has used live food (BSF or any other) to feed there pigeons ? Kingsley Hannah……the main ingredients in pigeon rations are grain and legumes. I don’t know if they would eat BSF larvae. The easiest way to find out would be to offer them some. How can I rid my wormery of soldier flies? They have taken over! lynda…….just wait for them to go through their various pre-pupations (five in total) and they’ll eventually leave of their own accord. In warm weather, it will take around a fortnight for them to reach the final pre-pupation stage. If you can’t wait that long, gather them up and feed them to your chickens. They’ll love you for it. This is wonderful information – thank you so much. But (deep groan) I discovered it a little too late for the enormous, heaving batch of ‘creepy looking maggots’ that seemed to suddenly appear in my worm farm. Sadly, I have already drowned them, though I was able to marvel at their ability to survive immersion and climb up almost verticle walls. Having read through all the info above I am quite in awe of these wee beasties and have decided to start a separate compost bin just for the BSF. As I’m going to use an ordinary black plastic rubbish bin with a lid Is there a particular access point into it that will allow the female to enter and lay her eggs? ie should I just cut a small hole in the lid? Karen……..you can use a rubbish bin to rear BSF larvae but you’ll need to modify it for the purpose. – Drill some small drainage holes in the base of the bin so that the leachate can drain out. This is powerful stuff….so much so that any time you want your significant other to spend a night in the guest room (or another country), just dab a bit of it behind your ears. – Drill a couple of small holes (about 25mm) in the lid so that the female BSF can enter the bin. – Wire something that she can lay her eggs into – to the lid. BSF won’t usually lay their eggs directly into the compost but rather somewhere adjacent so that when the eggs hatch they can just drop into the food source. – BSF self-harvest so, at this stage, it’s better that I refer to you to the BSF thread on my forum for the detail on that. You’ll also learn lots more about these amazing creatures…….here. I have just found this after searching for info on maggots in the worm farm. There are loads of these things in the compost bin, its literally heaving in there. So here I was thinking that I would get rid of them and I came across this info, thanks. So I guess I’ll just leave them be then. I don’t really need to harvest them for anything, I am happy to have them breaking down compost, so is it OK to just leave them in there? Will they still go through the life cycle and become adult soldier flies? Also I turn the compost regularly and feed the worm farm from that. Are they OK with that? Don’t want to upset my newly discovered worker population. Also to confirm the theory that they are soldier fly larvae, I went down to have another look and sure enough there are adult females everywhere trying to get in and lay eggs around the lid. Which is great. They seem to be more active in the afternoon though. Darren……you can leave them in your compost bin and they’ll migrate out once they’ve undergone their fifth pre-pupation…..to become flies and repeat the cycle. Don’t be concerned at the thought of breeding flies. BSF show no interest in people or their homes. Adult BSF have no functional mouthparts – they only live for 5 – 8 days just long enough to breed and lay more eggs. You can turn the compost heap. The BSF larvae will just move out of the way and then get back into it once you’re finished. In fact, if you’re looking for very rapid bio-conversion of plant and kitchen wastes, BSF are far more effective than composting worms. Once you’ve had them in the compost bin, you can expect subsequent egg-laying to occur. The female BSF is attracted to the scent of previous larvae activity. I was just sifting my compost and came across these little beasties for the first time in 30 years of gardening. I had no clue what they were until I started Googling and found you. Never thought I’d be happy about fly larvae! Toni…….if you’re keeping chickens, they’ll be even happier than you are. If you’re just into gardening, BSF larvae will become valued partners in bio-conversion of plant and kitchen wastes for your garden. I blog about BSF and I just wanted to comment on a few points made above. There has been a lot of confusion about the protein and fat composition of BSF larvae. 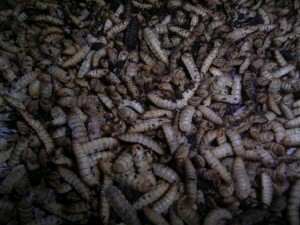 Meal made from the dried larvae contain 42% protein and 35% fat. According to Dr. Craig Sheppard the fresh larvae contain 17% protein and 9% fat. I’m afraid I used to misrepresent this in the past and I want to set it straight where I can. Something I also need to disagree with is the notion that BSF composting must be accompanied by foul odors. When a BSF colony is properly balanced it will not have a bad odor, at all. Bad odors are caused by an overabundance of anaerobic bacteria, something that is relatively easy to avoid. In fact I’ve had very good aromas emanating from my BSF unit in the past. The general rule is that a BSF unit should smell like wet straw and whatever waste you’re processing. I think the most common two reasons for foul odors in a BSF unit are poor drainage and overfeeding. Any standing liquid in the compost results in a zone with little oxygen. Even the constant churning of the larvae can’t support enough oxygen in a flooded environment. The BioPod as it is shipped does not have a good drainage system and you should add a pre-filter to the bottom before adding waste. Coconut fiber (coir) serves this purpose well but you must find a method of preventing the larvae from shredding it. One method that might work is to add a layer of soil or rocks over the coir to add some space between it and the feeding larvae. A wire mesh might also work. When I installed coir in my unit I covered it with about 10 cm of compost and all of my drainage problems were resolved. As for overfeeding I think a good general rule is that you should not add more waste than the colony can process in two days, on average. Jerry…….thanks for the clarification on the protein and fat levels. It’s a bit like Duckweed (which are often said to be around 40% protein) where the figure relates to dried weight. While I’ve yet to experience a BSF aroma that I like, I do accept that odour is often the consequence of what you put into the BioPod……and the rate of feed. I agree with you about the drainage design on the BioPod. On my unit, the stainless filter module is jammed in the retaining ring. I also discarded the plastic leachate container after the attractant splashed out onto my hand once too often. I use half a handful of spent coco coir in the collection bucket to dry up the moisture that can often otherwise gather there. I used to carefully pick it out when I fed the larvae to my fish. Now that we save them for our chickens, I let the birds do the sorting. I’ve just cleaned my unit out so it’s an opportune time to try your pre-filter suggestion…..and to commit to a better feeding regime. Thank you Gary, I think you have a great blog. I hope I can make time to explore aquaponics in the future. Maybe someday spellchecker will even recognize the word! Your experience with bad odors is the norm and I think it’s partially due to the BioPod and its incomplete drainage system. Please don’t misunderstand; I’m very fond of Dr. Olivier’s invention. It’s understandable that the first run of the first product ever made for a new science might need adjustments. Improving the drainage on a BioPod is simple enough, but our initial lack of knowledge caused many people to struggle with compost that was too wet and therefore created bad smells. The best anecdote I can offer about pleasant aromas from a BSF unit happened in a DIY bucket composter I once operated. I had just established a nice colony, it was draining well and the odor was light. I had half a loaf of stale cinnamon bread which I added to the unit. I wasn’t consciously monitoring that colony at the time, I was just using the bucket to get rid of my food waste. Later I passed by that unit and I noticed the distinct smell of cinnamon. Not only was the smell fairly strong, it was delicious! It was as if I had just walked by a bakery! Now, I must admit that it was a little strange to be attracted to a smell coming from a bucket full of food waste on a hot summer day, but that is what I experienced. I’ve had similar experiences processing breakfast cereal, pecans, dry pasta, etc. The dry pasta was a real surprise because it doesn’t smell much as is, but as the BSF processed it the smell was that of a boiling pot of it. I’m fond of pasta and it was odd to experience such a comforting and familiar smell coming from a composting unit. Last season I used BSF to process approximately 30 kg of whole fresh fish culled from my pond. I could lift the lid almost any time and find no pest flies in the unit. A person could stand just next to the unit and if they didn’t know what was inside they would not have known by smell. Of course I had a sufficiently dense colony that I could add 1-2kg of fish and see it disappear by the next day. Odor causing bacteria never had a chance to establish themselves. One more tip for keeping the colony balanced is to use wood shavings or sawdust as an additive if the compost becomes too wet. The wood acts as a moisture buffer and I half wonder if it has antibacterial properties. I have always used sawdust for this purpose and it might be part of the reason I’ve seen mild odors from my colonies. Shaving may help hold oxygen in the compost due to the shape of the pieces. Pressure treated lumber should be avoided because the insecticides might harm the larvae. Jerry…….I agree that the BioPod is a clever invention …….and that its weak point is the drainage system. I never had the same issues with odour when I grew larvae in a ventilated compost bin. Interestingly, we disposed of some spoiled bananas very recently which produced a yeasty sweet odour…..which bears out your comments about various feedstuffs. Given your input, I’m moved to experiment a bit more with drainage and moisture management. I am interested in setting up a bio pot to have the BSFL for the fish. I just want the BSFL only, should I have entrance hole in the bucket to a particular size eg 2mm dia. Or can you pls suggest any other way to have the BSFL only. Newies……I’m not too sure what you mean when you say BSFL only. Do you mean just BSF larvae as distinct from other fly larvae? If so, then the size of the entry hole won’t do it because smaller species of fly will be able to get it anyway. There’s no problem if other fly species do lay eggs in the BioPod. In fact, they are probably going to be more acceptable to your fish than BSF larvae. Over time, we’ve determined that only certain species of fish seem interested in eating the BSF larvae. Given that the tough outer skin is pretty much indigestible, there is also an issue with the amount of mess they introduce into the fish tank. We haven’t abandoned the idea of feed BSF larvae to fish but we have more work to do on how we best integrate the larvae into a fish diet. In the meantime, our chickens eat them by the bucketful. Ive been reading with great interest about the biopod; VERY exciting. I have braved the world of conventional maggots and am so happy to see a product that can protect us from the pathogens and general muck of dealing with houseflies and their larvae. I am interested in issues around other fly species – particularly houseflies – and their presence in the biopod. Is my biopod going to be swamped with them as well? I cant wait to produce some relatively clean larvae for my livestock and very keen on experimenting with your proposed larvae/duckweed combination and considering adding hardboiled mashed quail eggs as well for chook & fish food. Aeon……Black Soldier flies are amazing creatures. They are an excellent animal protein source for chickens and pigs. Chopped up, they will be eaten by quail……and some fish will eat them (although I probably prefer other fly larvae for this purpose). The larvae/duckweed/boiled quail eggs ration……bound by some bran and pollard (and possibly some sprouted grain) would be a very good ration for free range poultry. We have a white painted house in Melbourne and last summer had what we think are soldier flies. The larvae we found was a light brown colour, they then turned into a small fly, then into a black beetle which crawled up our white walls! I was not impressed, but reading some comments – Do I put them (the black beetles) into the compost? Try and find the larvae which was in my beds of rhubarb and runner beans and put that into the compost. Help required please! Barbara…….BSF larvae are about 20mm long when fully grown. Following their final moult (instars), they bury themselves in the earth and undergo transformation into a fly (as distinct from a beetle). You can find several threads on BSF on Aquaponics HQ. I’m trying to figure out a good system for mature larvae: How many to sacrifice to chickens and how many to put into the pupation bucket. I’ve also pondered over the idea of selecting the largest larvae just by quick inspection and allowing those to pupate, while the smaller larvae are given to chickens. Any thoughts? I’m a little confused about another thing: I observed several mature larvae that had pupated, as this was indicated by a popped out hole in the outer shell, though there were other larvae that had been in the pupation pod for months and had not pupated at all (they look all dessicated). Should they be presumed dead? Mike…..we through the occasional handful of harvested larvae onto the ground where they bury themselves while they are transformed into flies. This is not entirely necessary (because the larvae are all over the place) but we subscribe to the trader’s code that one should always leave a little something on the table. I doubt if selecting your larvae on the basis of their size will have much bearing on the size of future larvae because the small ones are generally the same as large ones but for the fact that they walked off early (often because of hot weather). I’ve had larvae die in the BioPod before…..I thought it was because I put a dead cane toad in the ‘pod (although I can’t be sure). Put your larvae in daylight and, if they don’t move fairly quickly, they’re dead. BSF larvae don’t much care for light. Was just wondering if anyone knew of someone in Melbourne (OZ) who stocked these Soldier Fly lavae? or phoenix worms as they are called in the U.S. I have Bearded Dragons and these Soldier Fly lavae are meant to be really good for them. Can anyone help? thanks. Troy……if you create the appropriate conditions for them, they will come of their own accord. Start to gather your kitchen scraps in a compost bin (one with plenty of holes in it) and, when you notice that the scraps are suddenly starting to shrink in mass (and turning black), have a dig around and I’d be very surprised if you don’t encounter BSF larvae. Do they normally come in summer months or is now ( spring ) a good time? also, do other flying insects lay there eggs also in the compost? I would hate to give my Bearded Dragons normal housefly lavae..lol.. or I suppose they look different to the BSF lavae? Hi Gary, it’s been a while since my visit to your place but I’m ready to start a bsf farm for my newly acquired flock. Now that you’ve travelled down the path, what is your best recommendation to breed them? If it’s still the biopod, who sells them in Australia? Suncoaster…..there’s a new BioPod (called the BioPod Plus) that I like better than the original one. The Australian distributor is currently taking orders for the new one which I think is due to arrive in Oz around November. I bought the 2nd last original one they had because they said they had no plans to import the Biopod Plus. If they said that so I’d buy the last of their stock I won’t be impressed. Having said that I also did some research and found a very novel approach. A guy who tipped a bucket on it’s 45% angle with strategic holes and another with a long PVC pipe at angle. Very cheap, and both look pretty effective. The thing I liked most about the PVC pipe was the left over compost can be extracted from the bottom thus leaving the working area untouched. Mike…….your use of hypertufa to make a BSF harvester is innovative to say the least…..nice work. Thanks for this post. Soldier Fly Larvae have been invading my Bokashi bin contents after I bury them in the garden. You have successfully quelled my revulsion; my only problem is that I have no livestock to feed them to! I guess one way or another they are helping us to recycle our home waste, so I might as well continue with what I am doing. Where can I purchase the larvae or eggs of BSF…in order to start a breeding program? Hi am in Kenya and have been in business of producing Soldier Fly Larvae for a year now.I use them to make my own pig and chicken feeds.I have plenty of the pupa i can sell. My name is Damian, I live in PE and some BSF have made their home in my worm bin. You can gladly have some! Dear friend, I write from Italy, and I am delighted with the home composting of food waste. I want to buy the BSF larvae, and I saw your page, which seems very interesting. How do I buy BSF larvae? how much it costs, and especially how much is shipping them to Italy? Thanks in advance. Im living in Phalaborwa limpopo, and im in desperate need of some BSF’s! Do you think there is a way i can get a few of your friends? maybe you can post me some of the larva? Ill be greatly in your debt! Where is BSF larvae obtainable in India? Sudhiranjan……If you create the correct habitat and food source for BSF, they’ll find you. Hannes……I don’t know if it is legal to post them to South Africa but I wouldn’t do it anyway. Translocation of species is not a good thing in most cases……and you never know what else you’re sending (in the way of pests or disease organisms) in the same package. I thought the larvae were just a ‘normal’ fly larvae, but then I never seen a ‘head’ on those before, nore the brown patch or the black line. These larvae are also a lot bigger then what I used to know as house fly larvae. I had a look on the net and as they have what looks like a head, it makes me think they may be soldier fly larvae. Can you shed light on it for me? Hi Damina. How sure are you that it is the black soldier fly? You say: My name is Damian, I live in PE and some BSF have made their home in my worm bin. You can gladly have some! If so I am very interested. Hi I live in Perth Western Australia, do you know of places that sell BSF larvae?? So I can start a system of my own. a question also…im in florida and the ants are …well just everywhere …they are nesting in my compost…how does if it does…effect ..well anything ..is it good or bad..i have no control over it and am not about to spray anything…they are slowly but surely bringing rich soil out of the bin…and also i want them to not harm the larvae…they seem to be symbiotic as far as i can see…thanks ! You mention the nutritional value of “Dried SF pre-pupae” is there a process of drying them that you know of? I’m familiar with drying superworms and mealworms but didn’t know if it works the same with BF Larva. I produce an over abundance of these and would like to begin preserving them for winter feeding to my chickens. Can they be frozen? Sounds great, I was thinking to use a barrel with a ramp for the larvae to climb and drop into a bucket off the end. Will they jump off into the collection bucket? I think I should dump a few on the ground for their perpetuation and feed the rest to my chickens. Is the ground (grass) the best place for the ones I want to survive (or should I even worry about that… seems right to me)?.. Eli…..There are several good designs for BSF larvae harvesters. You’ll find one here…..and another one that I think has real potential here. dear all i need to buy Black soldier fly larvae and bring them to Zanzibar, where i can buy? Salim Khatib…..Just keep loading up your BioPod and the BSF will find you eventually. Salim Khatib – I live in Zanzibar too and BSF larvae found my compost heap – I’m making prototype composter-harvester right now to promote to everyone who keeps chickens to feed them for free. If you want a handful of larvae contact me via my programme’s facebook page http://www.facebook.com/SustainableEastAfrica and you can have some! But get the conditions right and they will find you. where can i buy some Black soldier fly maggots or larvae. i am near paarl in the winelands. Where can I purchase Black Sholdier eggs or larvae? I am currently residing in Witbank. How much fish and poultry fodder do you produce onsite with the BSF larvae and duckweed etc., compared to the amount you need to buy in. How much meat and eggs does this produce? You said on another page that a vegetarian familly should be able to produce all their food on 1000sq meters. How much aditional land and inferstructure do you think would be needed to produce enough feed onsite for enough poultry and fish for a familly to eat flesh as well as vegetables every day? These are all good questions but, at this stage, I’d struggle to provide precise answers. As a micro-farmer, my primary ambition is to produce food rather than research data. This is not to reject the questions but simply to suggest that I have not undertaken that work…..yet! It’s fair (and logical) to say that I require less purchased feed for my quail (for example) by supplementary feeding of BSF larvae and duckweed. As to how much….I can’t be certain. I’m sorry I can’t be more help to you…..but I thank you for the question which suggests the need for a comparative trial around supplementary feeding. I might start with quail. Hi thank you very much for your response. Witbank is in Mapumalanga South Africa and about 100km from Johannesburg Gauteng and Pretoria. I would really would like to know where I can purchase BSF in South Africa. Your assistance in the above matter will be highly appreciated. Thank you once again for your response. My email address is vilkobus@gmail.com. Hi. I am very keen to start feeding my chooks and ducks BLF larvae and convert my compost. Where can I get some around Bellingen to get me started? Hi. I would like to grow some BSf larvae. I am near Coffs Harbour in Australia. Where can I buy some to start. If you create the appropriate circumstances (a store of decomposing plant or animal waste), the BSF will come to you. Just set up a compost bin and keep adding food scraps or animal manure to it. You’ll know when the BSF arrive…..because the “compost” will become darker in colour and its mass will be quickly reduced. I would be interested in buying BSF larvae in Kenya. Just in case William Mutahi doesn’t get in contact with me would you be able to share his email address with me? Your assistance is highly appreciated. I’ve responded to your request. Hi I am located in Adelaide, South Australia and want to buy some Black Soldier Fly Larvae to feed to my fish during the summer months. I need enough to get a culture going to provide a handful of larvae every second day. Freedom News Service » Commercial Aquaponics? Show Me The Money! – Microponics on Commercial Aquaponics? Show Me The Money!